Mathematically, you are absolutely correct - but it needs to be spelled out quite clearly if the claims, conditions of the tests, results of the tests and conclusions are to be properly understood ... especially by those less familiar with electrical engineering terminology and assumed knowledge. The torch is still going 4hrs after being completely drained by the Batteriser! Wasn't this thread intended for discussion of test methods? The old thread is still there for debate about the Batterroo claims and so on. True, but you go ahead and look through all the posts in this / the other thread to find the results / youtube links and so on. If I am a normal person and I want to see what is happening, I need to read the full thread? The conclusions are scattered in the thread. With lots of these tests now showing that "batteroo" drained batteries continue to function without the sleeve, sometimes for a significant amount of time, what are we seeing here? Is the batteroo circuit "nopeing" out on the amount of current that is going through it from the battery side as the cell voltage goes down ? could this explain the few report of extreme heat we have seen? The problem with batteries is that they are devices that convert chemical energy into electrical energy. And that physical process is rate dependent! A "flat" battery is simply one where the rate of chemical conversion is less than the electrical load, where we consider "flat" to mean "insufficient output voltage". So depending on your load, your battery can be flat despite still containing a huge un-used amount of chemical energy. "huge" is not the right word. This is what Batteriser are playing on. Battery energy discharge is well proven, and whilst there can be a lot of life left in a battery (e.g. a "dead" battery from an MP3 player can run an LCD clock for another year) that is entirely dependent upon the product the "dead" battery is used in. And if you actually calculate the energy left in a "dead" battery, then it's actually not a HUGE amount left. I know, but it's still hilarious and a very pertinent point for consumers I think. Reading the Batteroo marketing hype you'd think that the Batteriser extracts every last drop of energy from a battery. And a torch would not be considered a "low power" device by Joe Average like a remote control or a wall clock would for example. It's yet another thing Batteriser will not tell you. They in fact tell you the opposite, they tell you to use the Batteriser and only then is the battery completely flat and can be thrown away. Likewise they will not tell you that the Batteriser will give you less life in many products, because the amazing technology the have (boost converter) is already built into most modern products. You're missing the point. Batteroo claims to use up 100% of a battery. Obviously it doesn't. The complex world of electro-chemistry. could this explain the few report of extreme heat we have seen? No, that's a clear gross overload/short issue. 1) Batteroo does not seem to know the difference between Li-Ion and primary Lithium cells. Maybe we can try to figure out which exact LED-candle this is about, and try it with batteroo+Lithium cell? There is another possibility here. If the the Batteriser uses the intrinsic substrate diode to conduct reverse currents, then it may be vulnerable to latch-up particularly if the battery is a fresh 1.6V battery. This would particularly happen in a device with multiple batteries that was switched on as you added the last battery, or if the device had an electrolytic capacitor before the switch that could store a charge. When a single Batteriser turns off due to a flat battery (or if the loosey-goosey sleeve makes bad contact with the battery during insertion), you can get reverse current through the Batteriser, unless it actually somehow turns off by going open circuit. End result could be the same - a short - if the IC gets hot enough. Normally, you would probably add a reverse biased Schottky diode across the output to prevent the substrate diode from conducting. Actually with an incandescent light torch the batteriser will kill the lamp pretty fast. the typical 2 cell torch uses a 2V6 lamp, rated for lifetime (50, 250 hours, 500 hours or 1000 hours depending on the actual current rating) that will be significantly reduced with the overvoltage the Batterpoo provides. The 15% overvoltage will impact seriously on lamp life, not great to have a torch where the light output suddenly drops to zero, and you are not sure after the first time it happens whether the batteries are now totally drained or the bulb has blown. Buy a Batterpoo, buy a spare device and carry it around as well, just in case. Batteroo's claims are very relevant to this thread. They give very specific objectives for the testing. Those objectives have a direct impact on the types of testing that will need to be performed, how they are conducted and the measurements recorded. Just as significant as Batteroo's contribution, we have additional operational scenarios that raise interesting questions and alternative metrics for evaluation. 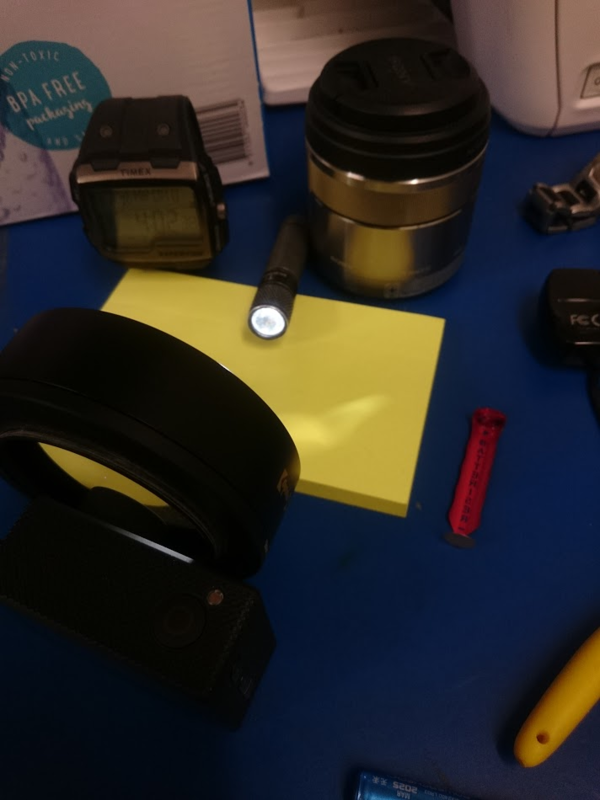 One of these is the aforementioned flashlight with/without sleeve case - and another is the 'post Batteriser' energy test. These - and any more that people can come up with - can become additional fronts in the debate on whether the Batteriser is a success or not, so performing the right tests and capturing the relevant data is important. That last point of 'capturing relevant data' is also something that cannot be understated. The initial train tests were initially reporting on total run time. This was challenged as being not very informative and the total number of laps was extracted. Further criticism was laid at the fact that the change in velocity was not provided - and that one measure of success was the duration of sustained velocity, not total run time. Another thing I'd be interested in seeing is the batteroo shown in Flir thermal imaging video, to see the hotspots, and how hot it gets under various loads... That could be a very relevant factor, for safety and functionality of certain devices. If they're operating at 80% efficiency, give or take, then at higher current loads there's a fair bit of heat to be dissipated per cell. Why not simply use your BK Precision variable load and test using different constant loads? You'd have the discharge curves as conclusive evidence that you can compare with and without the sleeve directly, without endless conversation about all of these what ifs. I even seem to recall seeing you doing pretty much this in a video. I'd do it myself but I don't have any of these things to hand. I also appreciate that you have to satisfy all of the clowns by demonstrating real-world battery life by comparing something simple, with and without, but there are so many variables to these complex devices, such as the satnav or the MP3 player that it doesn't fully answer the question. I also, also appreciate that it's Christmas and you've busted a nut to get the videos up that you have. Batteroo's claims are very relevant to this thread. The whole reason that the Batteriser is even worth discussing or testing *is* because of the outlandish and blatantly false claims made by Bros. Roohparvar. We should do both. The normal end user doesn't care about some abstract characteristic curves, but if the sleeve doesn't have any advantage for many products, this will help when people decide if they should buy it. Unfortunately I bricked my RK8511 electronic load (meanwhile I fixed it, with a new power supply that can deliver the 25 A required for re-calibration), so I couldn't do a test with higher currents, but at least some numbers are out, see here. Dave wrote that he will do tests with his electronic load as well, would be good to verify some of my numbers. I think it is very strange that it doesn't boost the output always to 1.5 V, but maybe I didn't measure it right? First time I did something like this. Of course you should use the same test procedure for all tests with one device and I'm sure Dave does this. I played the same song on auto repeat, on max volume and with the same headphones (some pillows over the headphones helped to do still some work while the test was running ). PS: does a SMU PC software have a button to measure and calculate an efficiency curve? I thought about building my own SMU (might need some time, because I already have to many hobby projects). Can't do 6 digits precision, high frequency etc., but better than 1% should be possible with cheap components and hobby-grade PCB layout. With the right software it could be very useful to characterize all sorts of components, maybe as an Arduino shield to allow writing all sorts of custom scripts for it. Couldn't find a finished and full featured DIY SMU project so far. I am quite excited about that thing so I just bodged together this test setup, but it should work to show what we want to know. Kind-of-Edit: Before sending this I decided to take a look at the setup after around one hour, batteriser is already off, non batterised one is still reasonable bright. I wait for the finished video and will update you how long it lasted. And the battery had enough juice left afterwards to recover to 1.36V and work on full brightness in a Lumintop Tool AAA torch. I will, but the product test come first because as I said, no one but us cares about performance curves. Whew! Thermodynamics is saved! Well done, Dave. I hope the tests have some impact. Just listened to a radio show over here covering similar hype over medical things back in the late 1700s and the new "scientific" methods of testing. Helped them throw out the "charlatans" who were "Mesmerizing" people at the time. They pointed out that often the results were rather real. People with nervous dispositions and aliments causing such things as depression soon "snapped out" of them. But probably due to the shock and excitement. These methods did not however have any effect on the claimed "all ailments, diseases and ills" that the pushers and peddlers sold.